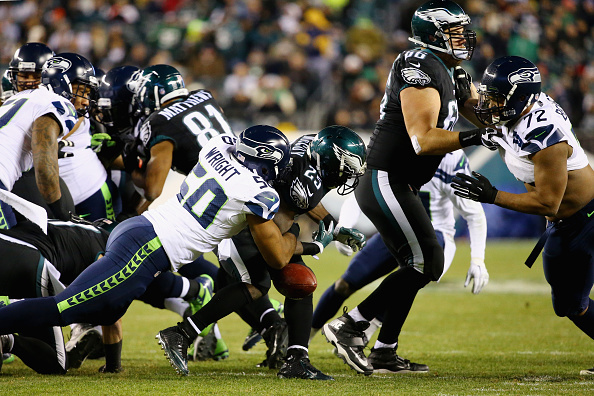 The Seahawks defense pounded the Eagles on Sunday, holding Chip Kelly’s up-tempo offense in check for most of the afternoon in Seattle’s 24-14 win in Philadelphia. Seattle seems to be heating up when it means the most, as they have victories over NFC West-leading Arizona (10-3), San Francisco (7-6) and Philadelphia in the last three weeks. The Seahawks dominated the Eagles statistically in the first half and took a 10-7 lead on Steven Hauschka’s 44-yard field goal. Russell Wilson’s 20-yard completion to Paul Richardson on third-and-15 kept the drive going. Wilson played well, throwing for two scores in the win. The day though belonged to Earl Thomas, Richard Sherman and the rest of Seattle’s “Legion of Boom” defense. The Seahawks set a franchise record by holding the ball for 41:56 and limited the Eagles to 45 offensive plays and 139 total yards, their fewest under Kelly. LeSean McCoy set a franchise record for yards rushing, but had a costly fumble. Mark Sanchez threw for just 96 yards and Philadelphia’s 10-game home winning streak in the regular season ended. The Seahawks were leading 10-7 when K.J. Wright forced McCoy to fumble on the first play from scrimmage in the third quarter. Thomas recovered at the Eagles 19 and Wilson connected with Marshawn Lynch two plays later. Wilson tossed a 23-yard pass to Doug Baldwin to make it 24-14 later in the quarter after the Eagles got within a field goal on Sanchez’s 35-yard pass to Zach Ertz. The Seahawks hadn’t allowed a touchdown since a 24-20 loss at Kansas City on Nov. 16. They beat division rivals Arizona and San Francisco by the same score, 19-3, in the previous two games. Seattle tied it at 7 on Wilson’s 26-yard run. Wilson faked an inside handoff to Lynch, saw linebacker Trent Cole commit and ran around the left side untouched for the score. 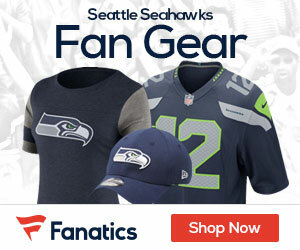 Subscribe to Seahawks Gab via RSS Feed or E-mail and receive daily news updates from us! Sign up to receive our daily Seahawks Gab newsletter, and keep up to date with all the latest Seattle Seahawks news. Celebrity Seats has all the best Seattle Seahawks Tickets, Seattle Mariners Tickets, and Seattle Sounders FC Tickets!